It’s as close to an admission as we’re likely to get from Zuckerberg about the negative effects his company has had on humanity. Of course, refocusing on “meaningful interaction” (that is, high impact posts from close friends) can only come at the cost of massively reducing the reach of publishers. A small price to pay, perhaps. But I think my own overhaul of Facebook might have Mark’s beat. There are certainly more efficient methods to unfollow everyone on Facebook, but I opted to dismiss people and groups as they appeared on my feed to see how the platform would react to my rapid decoupling. Present coworkers were replaced by past ones, and close friends gave way to more distant ones I probably owed a call or an email to. 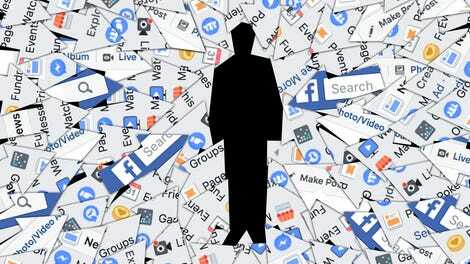 I saw names that were familiar from high school next to faces that were now strange, then relatives of exes whose digital friendship merited neither the animosity of deletion nor the awkwardness of interaction. It was a slow, weeks-long journey to the outer reaches of my social circles, all the way out to people I had no recollection of, living in places I’ve never been. As people disappeared from my timeline by the dozens, Facebook dutifully surfaced posts for me—although they were getting increasingly stale. Wishes of “happy birthday Tim!” directed at a musician I knew in college hung around for days after he’d turned, what, 29? 30 years old? At its most desperate, Facebook shoved week-old posts into my withering feed, starved for anything that would keep my eyes trained on its infamous blue and grey walled garden. Certain that I would at least want to see posts from a page I managed, my Facebook feed became a deluge of Gizmodo links—so I revoked my administrative privileges. By day three, the feed began visibly panicking. 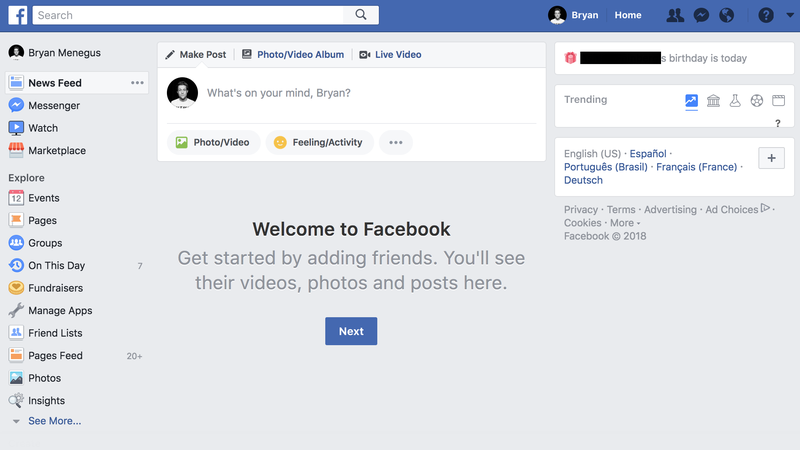 Keen to keep going, the next target on Facebook’s remarkably cluttered front page was the “shortcuts” menu—something I’ve never used and possibly never even noticed before launching this crusade to vanquish Zuckerberg’s UI for my own well-being. Like much of Facebook, these sidebar links appear to be automatically generated, and they can’t be deleted. But they can be hidden, manually, one at a time. When none remain, the shortcuts menu disappears. The same holds true for the “stories” module—with no stories to fill it, it collapses into nothing. Only one person’s story appeared on my feed, and I didn’t recognize the name of the poster. Unfriended. Gone. Trending topics can also be removed (one at a time) until there are none left, resulting in an eerie question mark, drifting too close to module’s border. But the topics refill so quickly that it’s hardly worth the effort. Functionally, nothing else on Facebook’s main page is optional. With the core product absent, a cavalcade of utterly useless features are all that remain, exposing the company’s ad hoc approach to harvesting time and data from users. The question mark just sits there. Similar to how I’ll open the fridge to stare at the same leftovers when I’m more bored than hungry, I used to check Facebook dozens of times a day. Call it emotional lethargy. It’s an unusual habit to break—one which hundreds of people a lot smarter than me worked very hard to make as difficult to quit as they could. Being greeted by nothing has provided powerful reinforcement. Not all of these memories need to remain stored on the servers of a company I (and much of America) no longer trusts, but I’d like some of them to be saved. Preserving what’s meaningful and deleting what isn’t will be an arduous project for another day. In another 12 years I’d like to relive a few of them again, with or without Facebook’s help.